What is it about a prime rib roast that tastes so good? Probably the flavorful fat, LOL. Creamy horseradish and au jus for dipping also helps. John has been craving prime rib since before Christmas and wanted to go to dinner on Monday night. All day I had packed away Christmas lights and decorations so cooking was the last thing on my mind. For both of us going out was the perfect idea; a win-win situation. Especially since he sold a bike on his first day back at work and it's also the store's first bike sale of the year; another good reason to celebrate! Soon we were at the Green Valley Resort & Casino's buffet with a plate full of prime rib! Eating a large dinner is something we try not to do on a regular basis so this occasion was an exception. Afterwards we tried our luck at the slot machine and won $58.00!! It's not the lottery winnings but it was enough to recoup the amount we put in to play, cover the cost of our buffet dinners and part of the tip. So for dinner and entertainment, we spent a dollar. Not bad! Hmmmm, I have not had lunch yet. I might head over to Sunset and get the 6.99 buffet!!! @Johnny: it sure is a great deal! 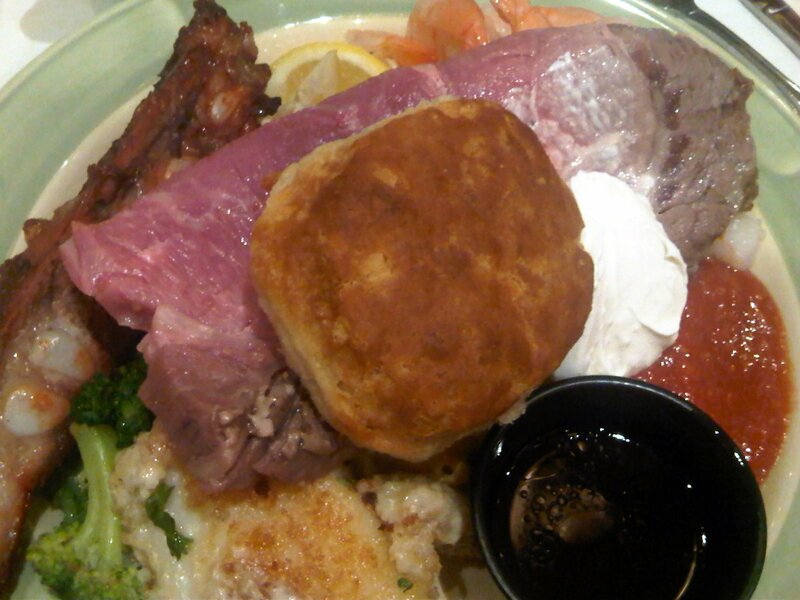 You can have your fill of prime rib or beef roast. All right D - pix of your food makes me want to run to Vegas too! Red eye flight, here I come!